Well, Christian Liaigre can do no wrong. Everything he designed is just so perfect. 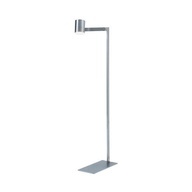 Take for example, the Chantecaille Floor Lamp. The form is so pared down yet somehow it looks luxurious and the proportion is just spot on. One of my client is getting one for their living room. They don't know this yet but they will know soon! :-) Can't wait to see it in the spot that I have in my mind. For those of you who never heard of Christian Liaigre, he's a French designer that shot to fame in the US because he did the Mercer Hotel in Soho in 1998. According to NY Times, "the low, starkly elegant wenge-wood furniture that Mr. Liaigre designed for the lobby and rooms became a touchstone for minimalist décor. It also made him a household name — at least in 1 percent of houses." Since then, he opened furniture showrooms in NYC and Miami. His clientele has included Rupert Murdoch, Larry Gagosian, and Karl Lagerfeld.